Gerd Gigerenzer is best known as Daniel Kahneman’s fiery intellectual opponent. Kahneman’s research programme is known as “heuristics and biases”, which has found many scenarios where automatic thinking leads to decision-making errors. Gigerenzer researches “fast and frugal heuristics” – understanding when simplistic decision-making strategies can nonetheless lead to good outcomes. Kahneman’s popular science book “Thinking fast and slow” has been a great hit for spreading behavioural science. “Risk savvy” is Gigerenzer’s latest popular science book. Gigerenzer’s broad message is that non-experts can often be surprisingly good at making decisions. For example, when guessing the relative sizes of cities, people are often more accurate for other countries than their own. The simple “recognition heuristic” can be employed and is surprisingly accurate if a German is guessing which city out of Detroit or Milwaukee is bigger, but can’t be used by an American who knows both cities. Risky Savvy presents many of the key results from Gigerenzer’s research, often with demonstrations in the key applied domains of medical and financial decision making. While it might seem natural to outsource key decisions in these domains to experts, ie doctors and financial advisers, potential conflicts of interest might mean this is not always wise. Gigerenzer presents evidence on how to make better decisions in these domains, e.g. understanding the statistical nature of breast and prostate cancer screening, and how naive diversification strategies can outperform more complex techniques. The discussion between Kahneman and Gigerenzer, on whether human decision-making is riddled with errors or is surprisingly efficient, is best summarised in two theoretical articles published in Psychological Review: Kahneman and Tversky (1996); Gigerenzer (1996). These articles are well-worth reading, but suffice to say the debate has at times been rather heated between the two theoretical positions. But while reading through Risk Savvy, it struck me how for practical purposes the gap between Kahneman and Gigerenzer seems to be narrowing. Institutions and individuals often do not make optimal decisions. Advocates of nudging (who generally come from the Kahneman school) often stress the benefits of simplification, similar to the message that Gigerenzer has been preaching for many years. And likewise, Gigerenzer stresses in Risk Savvy institutional limitations to good decision making, which is what choice architects and other researchers in behavioural economics have been arguing. 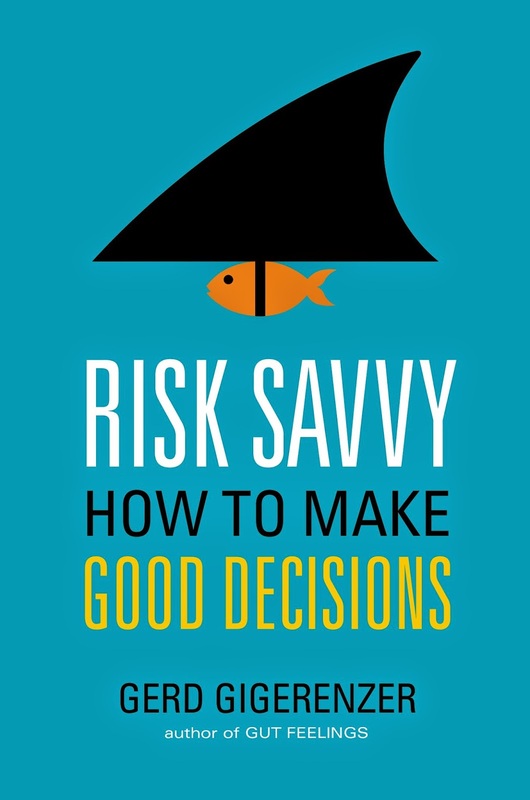 While not explicitly advocating nudging, Gigerenzer recommends a programme of risk literacy interventions to help debias many of the errors that he discusses in Risk Savvy. While choice architects would point to the limitations of information-based interventions, and argue for stronger measures (such as default options), both parties are in agreement that something should be done to help ordinary decision-makers. As William Blake wrote, “Without Contraries is no progression” – and I can thoroughly recommend this latest book from an often contrary researcher. My key takeaway is that lots of exciting applied work is still to be done in behavioural science, and this can only be helped if more applied researchers gain a fuller understanding of key debates from the theoretical literature, which Risk Savvy does in an accessible manner.